No human being has the ability to peer in-between roofing layers to detect subsurface moisture but now they have the technology. However, few commercial roofing contractors invest in this technology but it is an important asset when wanting to do a professional flat roof repair right the first time. An ir scan inspection can mean the difference between a flat roof repair and a full flat roof replacement. 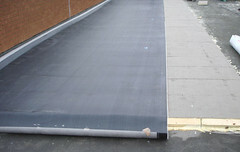 Potentially saving you thousands if not millions (depending on the area of flat roof) on your flat roof repair bill. Most commercial roofing contractors still rely on years of built up knowledge in terms of knowing where to look and what to look for when looking for leaks. They recognize subtle clues as to where moisture is most likely to penetrate, and where it would spread. This knowledge is essential and irreplaceable, but it is undoubtedly inefficient and now incomplete. The advent of infrared imaging technology, and sequential improvements – once upon a time needing teams of professionals, liquid nitrogen cooling --infrared scanners have become a useful asset in the roofing industry. Now, good commercial flat roofing contractors offer ir scan inspections – a way to see sub-surface moisture many times in areas that cosmetically appear sound. This sees the roofing contractor’s role shifted to that as roofing consultants. 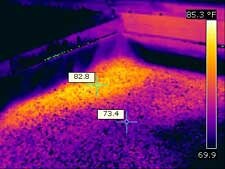 Roofing consultants (the ones doing the infrared roofing inspection) use their infrared cameras to look for hot spots on your commercial flat roof. Areas of moisture-laden insulation or water heat and cool at a slower rate than surrounding material. Thus, they have a different temperature when the roof is heating and cooling and can be spotted with an ir scan. This affords the commercial roofing contractor surgical precision when handling flat roof repairs – targeting the areas that need replacing and leaving sound areas intact. But the role of roofing consultants is important as a client needs someone to consult – listen as well as suggest – with them about the best course to take. This does not mean you do not have to re-roof ever again, but it does mean that you never have to re-roof the areas that are still structurally intact ever again. This cuts down on flat roof repair costs, and eliminates tonnes of waste that would otherwise end up in landfills. An IR scan is therefore, indispensable industrial roofing applications where one is dealing with large surface areas. The technology will eventually become universally adopted and seen as indispensable, it is only a matter of time, but meanwhile one should be careful of picking and choosing a commercial roofing contractor who embraces change and can provide this money and environment saving bonus.